When I started this blog back in 2012, I didn’t know much about Art Nouveau. This blog became, so to speak, a record of my discoveries on my ‘journey into getting to know Art Nouveau’. Since then, I have read dozens of books, traveled all over the world and surfed the world-wide web. I also attended conferences on all sorts of subjects, as long as they were related to Art Nouveau. And even though there is always more to learn, in 2015 I decided it was time to turn this out-of-hand-hobby into a full-time job. On the 1st of January 2016 I founded my company Maison l’Art Nouveau. In the two years prior to that, I had scoured the whole world for period-correct materials to decorate our own family home in Art Nouveau style. It wasn’t easy, but after a while I did manage to gather a good deal of beautiful products. Think Art Nouveau wallpaper, curtain fabrics, upholstery fabrics, ceramic tiles, lace panels, mahogany beds, rugs, dado panels etc. You name it, I found it! But since it had been so hard to find the correct products, let alone find enought products to actually have a choice, I figured it would be a waste not to put all that information to use. I was sure there would be more home-owners out there, who would love to find their perfect period correct interior decorating materials. So my knowledge has now become the heart of my business. Today, I can help other Art Nouveau lovers find everything they need in one place, at Maison l’Art Nouveau! Anything you could possibly need to decorate your Art Nouveau home, I import directly from the manufacturers. From fire clay kitchen sinks, to hand painted tile panels, and from silk screened wallpaper to Scottish lace. It’s all here! Besides, I gathered a long list of crafts people who create the most amazing decorative wallpaintings, who can sew your curtains for you or advise you with your carpentery. That’s also why there is no webstore: I prefer to work on a personal level with my customers. That way I can advise and suggest materials best suitable for each situation. Customers can call and e-mail me. And when necessary, we can meet in person (so I get to see the most amazing interiors!). My personal goal is to create awareness of our beautiful Art Nouveau heritage, in order to protect it for future generations. To do so, I also give lectures about Art Nouveau, write guest blogs about Art Nouveau and build Apps related to Art Nouveau and Tourism. That way, I hope to reach and enchant as many people as possible. And hopefully I can make the lives of those people a little more beautiful. After all, isn’t that what Art Nouveau is all about? Slowly but surely, professionals learn where to find me too. So I get to work on interior decorating projects with hotels and restaurants. And recently, even some internationally renowned museums have reached out to me. Isn’t that just wonderful? I’ve got the best job in the world! At the moment, my website is only in Dutch as I wanted to limit the number of enquiries and get to know the ropes before I expand my business to the rest of the world. However, if you are not located in the Netherlands or Belgium, and you do need some help with your interior decorating, don’t hesitate to contact me anytime. 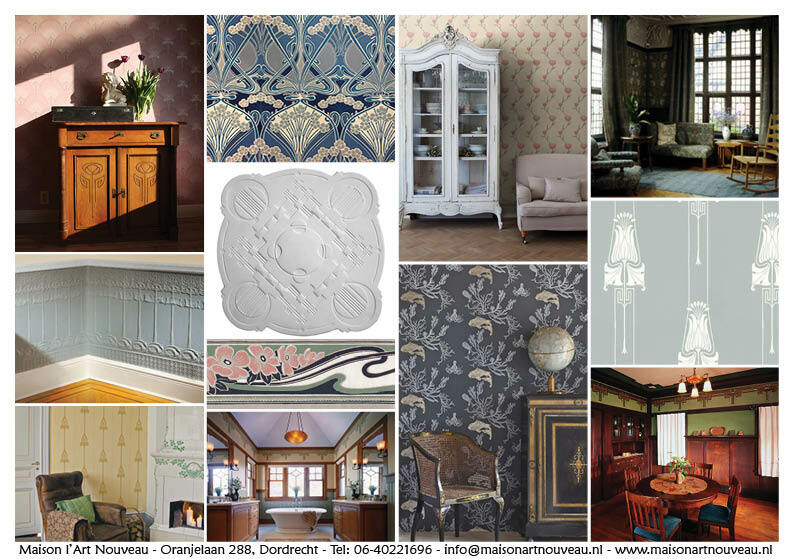 I will do whatever I can to help you turn your house into a stunning (and period correct) Art Nouveau home! 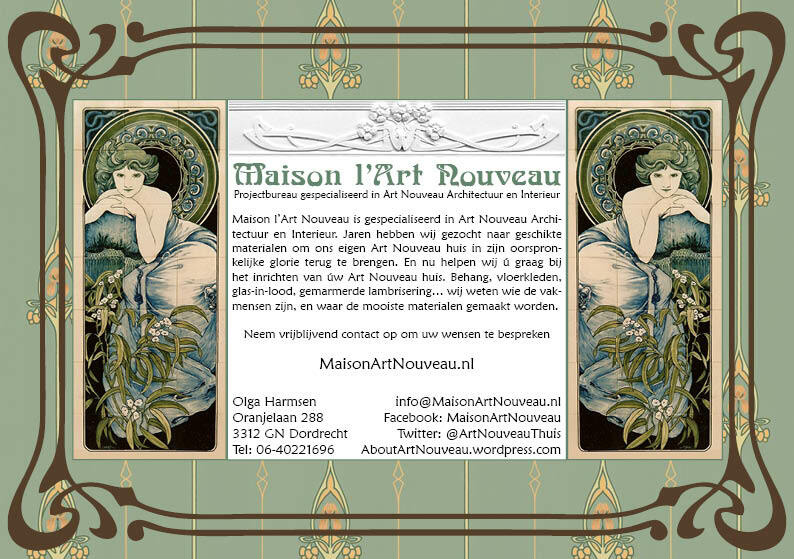 For more information, please visit Maison l’Art Nouveau at http://maisonartnouveau.nl or contact me at info@maisonartnouveau.nl. I’ld love to hear from you!